When it comes to comic books, women can seem truly two dimensional. Not so in the Prada universe, as last night’s SS18 womenswear show proved. Here’s what went down. Not surprisingly considering the SS18 menswear set this summer, the showspace was transformed with comic book prints. This time, however, they depicted different facets of women – from the blunt-fringed teen in her bedroom with her guitar (and a Black Flag sticker on the dresser) to a 40s-era illustration of a red-head knocking a man down with a single punch. Girl power. No, but seriously – we’re talking Lana Del Rey’s “Video Games” meets Nirvana’s “I Hate Myself and Want to Die”, which I specifically remember downloading as a tween and playing on repeat so my emotional depth would be displayed to the world via my MSN. Cringe aside, Frédéric Sanchez’s mix for this season was beyond. PJ Harvey, loads of The Cure, Kim Deal, NINA SIMONE! It was a rundown of outsider anthems from different eras, and it was brilliant accompaniment to the collection. The comic prints weren’t just on the walls – they also appeared in the collection, on everything from bags and shirts to coats and earrings, in what was a collaboration with a grand total of nine female artists. We’re not talking superheroes in impractically small clothes, or anxious Lichtenstein heroines pining over a man. 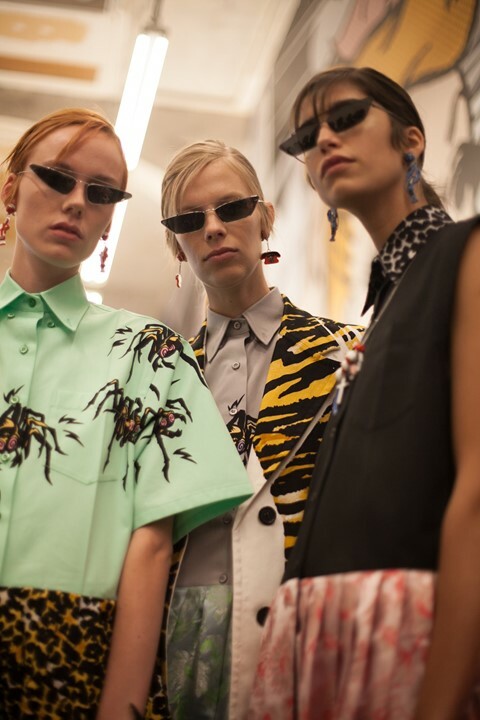 From young talent to old legends, Prada said she was inspired by “how spirited (the artists) were and how they captured women in a very real way”. To read all about ‘em, head here. And, on a related note, lots of trousers. (That might not sound like a big deal, but Mrs P is famed for her love of skirts – she’s done whole collections with no trousers at all). Here they sometimes came with typically feminine, floral dresses or tops overlaid, like walking comments on the duality of women. Other times that contrast was channeled in the mixing of those same tops with shirts printed with black spiders. Rejoice, ex-emos – that staple is making a return. 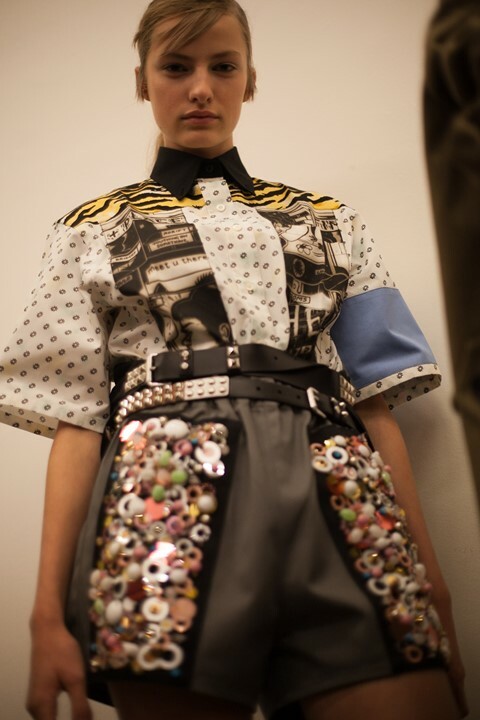 The subculture nods didn’t stop there – in what felt like an exploration of the symbols of female rebellion, there was leopard print, studs, and a lot of that classic Hot Topic combination of black and red, too. Also, the coats added a distinct Teddy Girls vibe, like modern versions of those captured in the late Ken Russell’s photo series in 50s London.